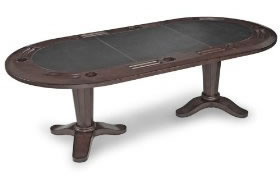 Designed to accommodate eight players with sufficient elbow room to play comfortably, this oval, 47-inch x 94-inch hardwood hold-'em table with distressed-walnut finish features a charcoal-colored leather surface. Each player position has a chip well and a cup holder. Two sturdy three-footed pedestal bases ensure stability and contribute to the table's heirloom-quality construction and design.